Maaaaaaybe. 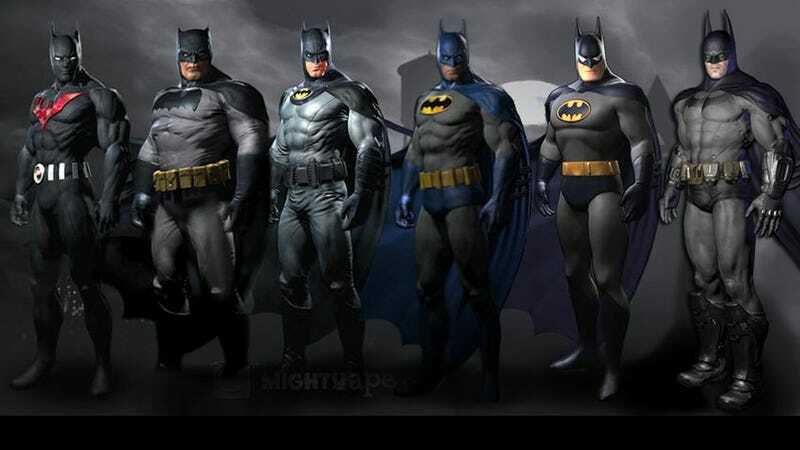 At least, the number of preorder skins currently available for Batman: Arkham City is certainly pushing the envelope. A British fan site has put together all of the skins available for customers in the UK (some of them are available outside Europe, others not), and it's a little bananas. There are five available, most of them from unique, competing retailers, and while many of them look great - the Dark Knight Returns one especially - you should probably refrain from getting any of them. Why? Because the more people give in to this, the more publishers will know they can get away with it. You want them to can this crap, then stop buying it. Simple! For the record, the skins are, from left to right, Batman Beyond, The Dark Knight Returns, Earth Zero, 1970's, The Animated Series and the default skin.